Last October I made a trip across the country with my good friend, Jessica, to pick up a baby who needed a temporary home. I'll never forget that Tuesday morning phone call and I'll never forget hearing God say to go. God has been unfolding that story ever since. It hasn't been easy, to say the least, there have been a lot of tears and a lot of unknowns. But I have never questioned God or his call for our family to provide a safe and loving home for a baby in need. I'd walked through foster care with several friends of mine. I'd always told Bryan I didn't think my heart could handle it, my emotions couldn't handle it. So we'd never gone further into the conversation than that. Then this situation presented itself. It is a very specific situation, where this baby needed guardians while her mom (and dad) figured things out and got help. We had the space, we had the finances, we had the love... so we said yes. And I was right, Jenna, alone... she doesn't have the heart or emotional capacity to handle the gravity and the unknowns of this situation. She is weak and tires easily. But God does. And I've seen a transformation in myself that cannot be explained any other way. God has covered me in perfect peace. I see His words when I close my eyes. I hear His voice when I start to doubt. After 3.5 months of not knowing what the next stage of this story would look like, having to send a sweet girl to live with our friends temporarily and relying on a judge in another state to make what he thought was the best decision for this baby girl... Bryan and I were granted guardianship of sweet Remi last week. We started walking a road with Remi, and her mom Maegan, this last week that we don't know the ending to. We've transitioned from 3 kids to 4 kids back to 3 kids and now back to 4 kids. It's been a little chaotic, but the time she was back with our friends gave us time to get our affairs in order and get the boys registered in full time school. Our prayer all along has been that we would get Guardianship of Remi and be able to forecast the rest of the story from there. But guess what... we can't. So we move forward in this journey, completely dependent on God. 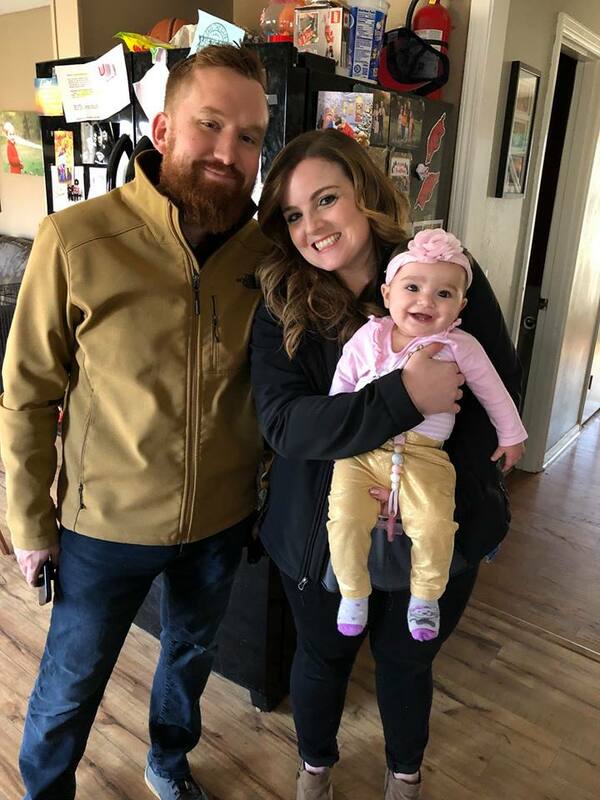 He's known the details of this since before any of us were born and we are praying fervently for Maegan and her recovery and for Remi and her sweet future. Maegan shared this picture and a sweet post on her facebook page about us after court last week, so I am sharing all of this with her permission. 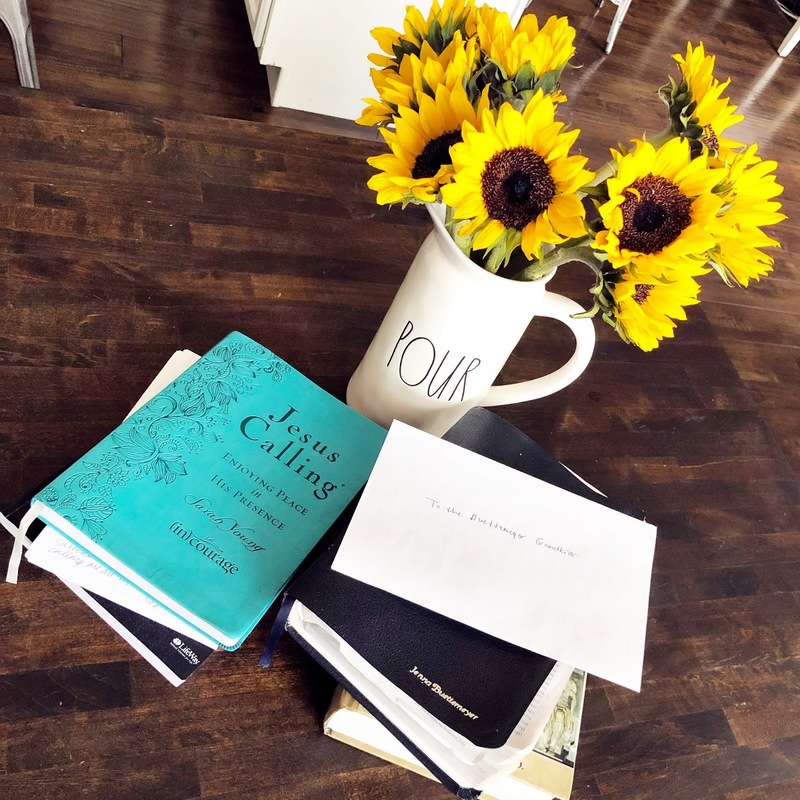 She is seeking the Lord's will in her life, and I know I have so many prayer warriors who follow my blog that we ask you to pray alongside us all. God has been in the details, God is in the details. I am so glad He is big and has a bigger picture than I do. And I am so glad that Bryan and I get to step in and be a part of Remi and Maegan's story. My goal has been to blog once a week. I've been asking God to give me a word to speak on, something each week to share... and this week, boy did He. I've been going to Tuesday morning bible study for the past 18 months. I love it, it's like a mom escape because I grab Starbucks or Sonic on the way there and I can drop whatever kids I have that day off in childcare and I have two hours of girl time with some of my favorite, and some of the most encouraging, people. The Bible study that we did last fall, along with the work God was doing in me, completely changed my life. We are doing the Bible study Authentic by James MacDonald right now and so far it has been really good. This week we talked all about how to actually study the Bible, and then watched this week's video which was about prayer. I've been blessed to know and look up to several prayer warriors in my life. My great grandma Joy is always the first that comes to mind. My mom is another. My mom's close friend and basically my second mom, Ms. Janice, is another. They are all people who I know if I ask them to pray, they will without a doubt. But another one that sticks out to me (and that I couldn't get off my mind on Tuesday during study) is my Mother-in-Law, Janet. Any time Bryan and I were concerned about something, asking for advice... no matter how big or how small, she'd always ask, "Have you prayed about it?" I remember her saying that about what I considered to be the silliest things, like finding my car keys or needing to change an appointment. No, of course, I hadn't prayed about that. Her wisdom still is fresh on my mind like it was yesterday, God cares about us in the littlest things just like He does in the big things. I left Bible study really missing Janet. If she was still alive she would have been there with me. She would have been up there that Tuesday morning chatting with all the ladies and showing off pictures of her 5 grand babies. I can hear her and her southern accent talking to everyone (because she knew EVERYONE) in my mind as I type... but God chose to take her 5 years ago, so she isn't there. During study on Tuesday we had talked about concordances and sentimental bibles that were special to us and I couldn't wait to get home to get my concordance out of the attic, that and well, my Bible. Bryan gave me a new Bible on our wedding day with my new name on it and wrote on the inside cover. It is a precious treasure to me... but several years ago it got stuck in a desk drawer and ripped in half. I'd looked into getting it fixed but never took the steps to actually do it. I then went several years without picking up a bible... and this last 18 months I've been using a pocket bible that fits in my purse, it's been fine, but it isn't MY Bible. So I got home... hopped up in the attic and quickly found both my concordance and Bible. I went back down and set them on the kitchen counter. I opened up my Bible and I completely lost my breath. Inside the cover of my Bible was a letter that Janet had written to "The Buettemeyer Grandkids". I'm still not sure if I ever knew this letter existed. Part of me has a vague memory of her writing some things right before she went into hospice. I didn't remember this letter specifically though. Bryan doesn't remember it. But regardless, it somehow made its way into the front of my bible, a bible that I probably hadn't picked up more than a handful of times in the last 5 years, and definitely not at all in the last 3-4 years. Janet used to tell us about God Winks. It's from a book that she'd read. Basically it's similar to the concept of a coincidence but more along the lines of a sign from God. This was a major God wink. I got to read her words, in her handwriting. I was so encouraged. The whole letter is basically talking about how she knows the kids will be sad not to have known her, but how she is happy in Heaven because she lived her whole entire life for this. Be still my heart. We haven't shown the boys yet. Hudson is definitely old enough to understand it. 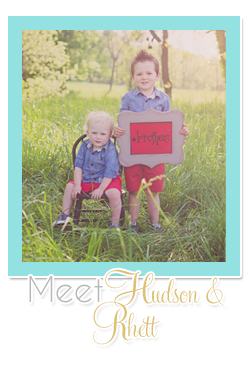 We will show them soon, but we wanted to keep the content of the letter private between them and G-Ma. And as I was sobbing and telling my mom that I'd found it, she made the amazing point that it was special that Janet didn't address it to just Hudson and Rhett. She didn't know anything about Sawyer, he wouldn't come for several more years... and whatever other Buettemeyer children there may be in the future... she addressed it to all of "The Buettemeyer Grandkids". This was the second "God Wink" of my day on Tuesday. The first was winning the Bible study "raffle" door prize. In the 3 semesters I've gone, I haven't ever won, I am a pretty unlucky person by nature. But this Tuesday, I did, and it was a beautiful bouquet of Sunflowers, which are my favorite flower. I saw them as I dropped my name in the bucket and somehow I knew then they were meant to be mine... and they were. Bryan and I are in a season of worldly chaos and complete turmoil. I have never felt more out of control of my future in my whole life than I do right now. My spirit, however, is resting easy because God has 100% gone before me, and I rest in that truth. We are dealing with legal proceedings, scary and unknown things, and definitely more difficult things than I thought I'd ever have to see in my life, let alone my early 30's. These things that I struggle to explain to my kids, things that can keep me lying awake in bed at night for hours... these are the big things, but God. God has been showing me lately that in the little things, He is taking care of me. He gave me the sunflowers to brighten up my home and heart. He gave me Janet's letter so I could hear something special from her on a day I missed her so much. He's also showing me that He is working out the big things, I just can't see it yet or as easily as I did with the other things. I've heard Him over and over again saying, "Jenna, trust me with the little things. Obey me in the little things. If you can give me the big things, give me the little things too." That's the message on my heart today. I got to hear straight from Heaven this week. I'm turning over the littlest things, knowing that sometimes the little things are what add up to be the big things. What happens when you choose joy? ...well let's start with what happens when you don't. 2018 was a hard year for me. And actually it probably started more towards the end of 2017 and carried over. I had postpartum anxiety, got diagnosed with a painful inflammatory condition, got shingles, struggled to lose weight again, got some very hard personal news, my dad battled thyroid cancer... and that is just the beginning. Then I ended up sitting up one whole night in the rocking chair with Sawyer when he was sick last Spring. I'm not sure if I pinched a nerve or what but I ended up with severe neck pain. I went to the chiropractor, I took prescription meds... then the tingling started. Neuropathy isn't something to play with. The whole left side of my head and face started either throbbing or tingling, feeling like it was going to sleep... then my mouth and neck. I was horrified what this could mean. I carried all of those things- the emotional and physical things. They were like a weight on my back. All of the practical things I could do weren't working. The chiropractor helped briefly but the pain would come back. I was taking prescription pain medications to function. Bryan had to miss work and stay home with me so I could recoup. I was grumpy. I wasn't joyful. I was mad at my circumstances and mad at God. I lost myself. I was carrying unforgiveness. I wasn't a fun mom or a happy wife. I was an anxious wreck, my kids couldn't leave my house without me almost going into a panic attack worrying about them. I wasn't enjoying the things I used to enjoy. I neglected the blog I love. I couldn't work out. I didn't care about eating healthy. I felt like crap. In July we got some more heartbreaking news. It hit me very hard. I had a dream of what could be and that dream was shattered as quickly as it started. So I took a day to be sad. I took the boys to get happy meals and we went to the park. I let them play while I ate my McDonalds salad without a fork (thanks a lot for that McD's). I cried on the phone with Bryan for what seems like forever but I am sure was only a few minutes. I was upset because God didn't do something that I thought would redeem all of the bad... not just the recent bad but also the not so recent bad of losing Janet and everything that came with that. Bryan's words to me that day changed my trajectory. God spoke through him because He knew he'd be the only one I'd listen to. "Jen, if God never did one good thing for us ever again, it would be okay. He sent Jesus to die on the cross for us. If that's all He ever does, that's enough." He was so right. I sucked it up. I stopped crying and let go of that shattered dream and decided to move on. I went to the doctor for my neck and got a steroid and lidocaine shot in the back of my head, and it started to relieve the pain. I overhauled my diet. I cut out gluten completely, something I'd dabbled with and "cheated" on several times in the last 15 years. Within two weeks my facial numbness was completely gone. I'm over 6 months completely gluten free now. In September I started a new bible study. It wasn't really the bible study I wanted to do, but my best friend said it sounded good so I went along with it. I started reading my bible. I started trying to pray again. But Jenna didn't have words to pray. I didn't know what to ask for. I was numb literally and physically. So I just started writing scripture. I started in my prayer journal. And then I moved to note cards. I taped note cards with the scriptures I was writing all over my house. As I started reading and filling my mind with God's words, my attitude started to change. On the advice of my mom, I listened to a podcast by Lysa Terkurst that spoke volumes to me. I took away a huge key thing and wrote on my mirror (it's still written there today). There is what Jenna sees... and what God is doing. I've listened to that podcast 4 times now. As I continued to read my Bible, listen to uplifting podcasts and books and saturate my mind with GOOD and with GOD, I felt God telling me to let go and let Him step in and carry my burdens. So I did that. I gave it all up. It's been a process and didn't exactly happen overnight. My neck pain disappeared. My neuropathy was gone. The personal problems didn't feel so overwhelming. The anxiety was still there, but was better. I didn't know why, but I was looking at God's words everywhere I looked. The bible study I was doing was James McDonald's Think Differently. It dove into the story of Issac and Jacob. Everywhere I looked, and still look, I'm getting this story from different angles, to the point of when I start listening to something and it's about another aspect of the story I start laughing. "Got it, God, You really want me to understand this!" ...And then on October 23 while driving to bible study I got a phone call that changed my life. I can't share a lot about this story yet, there are a lot of unknowns and it has definitely not been easy. But on October 23, God healed me of my anxiety. God has showed me why I was memorizing HIS words. He knew I'd have dark and very sad days. He knew there would be a lot of unknowns. He knew I couldn't do it, but He could. He brought my joy back after months of searching for it. I was able to close my eyes in the midst of very hard things and see God's words that I'd written. Every time the unknowns crept in or I needed comfort- His words came visually to my mind- that's why I'd written those verses. That's why they were all over my home. He knew I'd need them in my mind when they weren't physically in front of me. July Jenna... she could not have handled the situation I am in right now. October to now January Jenna... she's hanging in just fine. This new Jenna gets to love on a baby girl, part time right now. She's in the middle of legal craziness. Her family has been scrutinized with a home study which she was told would NO WAY be done by the end of the year (BUT GOD. God worked it out, and we got it finalized on Dec. 30 ;)). She's been misrepresented and been in a place where she's unable to clear that up. 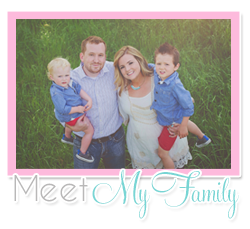 July Jenna wouldn't be able to get out of bed because of the physical pain and the severe anxiety she'd be under. But not me, I'm changed, by the GRACE of God. I won't stop sharing about it. I wish I could share every detail and how God's hand has been on EVERY single detail over the last few months... and that that's included me sobbing on my bed and God preparing me for disappointment and me just rereading verse after verse in my prayer journal that I'd written since early September. I say that to tell you that just because He's healed me, He hasn't given me an easy journey to walk right now. So what happens when you don't choose joy? When you think you've got a plan and it doesn't work out? ...nothing good. This is not a good place to be. But when you do start to choose joy again and allow God into the dark spaces... the light shines again. I don't know how my story ends. Or how the crazy journey that started back on October 23 ends. But I do know that God is good. He is faithful. He goes before me. He hasn't given me a spirit of fear. He withholds no good thing from those who do what is right. When I start to feel the anxiety creep in, I go back to those facts. His word holds true. I don't know about you but my kids LOVE Chuck E. Cheese. I love the fun and safe environment and it is a place we frequent often, for sure. I even remember going there as a little girl. It was one of my favorite places even back then! 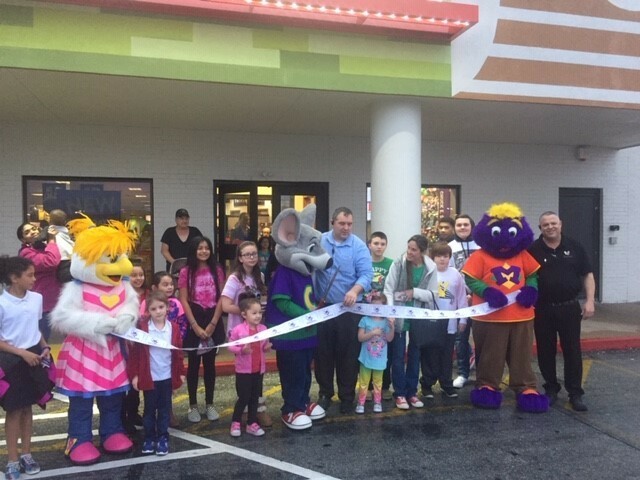 For more than 40 years, Chuck E. Cheese's has provided families across the country with a safe environment where they can enjoy delicious food and quality time. 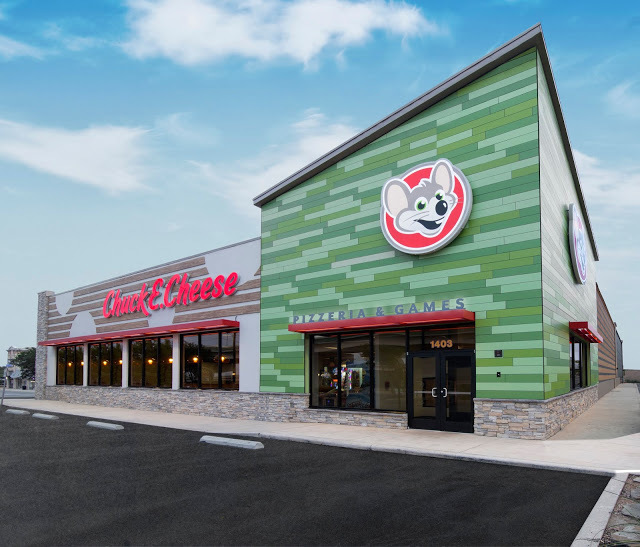 Lately they've taken on an extensive exterior and interior renovations which is part of Chuck E. Cheese's continued commitment to local communities across the country and their promise of delivering a fun experience for the entire family. There is a brand new light up dance floor where the hourly live show and birthday show will take place! AND there is a Birthday Zone featuring difference party sections designated by characters in Chuck E.'s band. The restaurant features a calmer ambiance with warm wood, neutral tones and streamlined graphics. I can't forget to mention the new games in the remodeled game rooms!! I also can't forget about the food. Chuck E. Cheese's remodeled restaurants also feature open kitchens so guest's can watch the pizza making process. 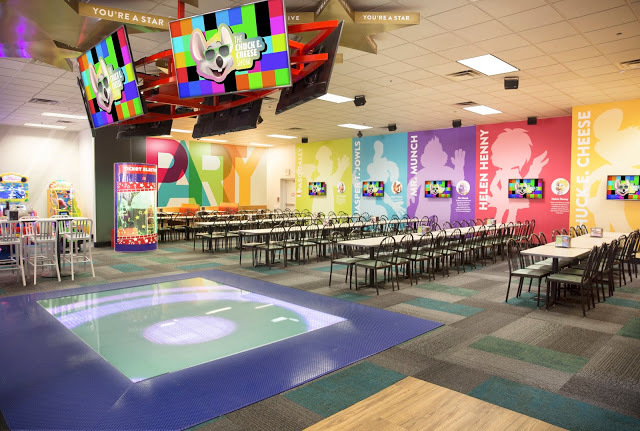 Chuck E. Cheese has also recently launched their all new All You Can Play, a first of it's kind gaming experience where parents can buy time instead of tokens or play points, making it easier than ever to play any game at any time. 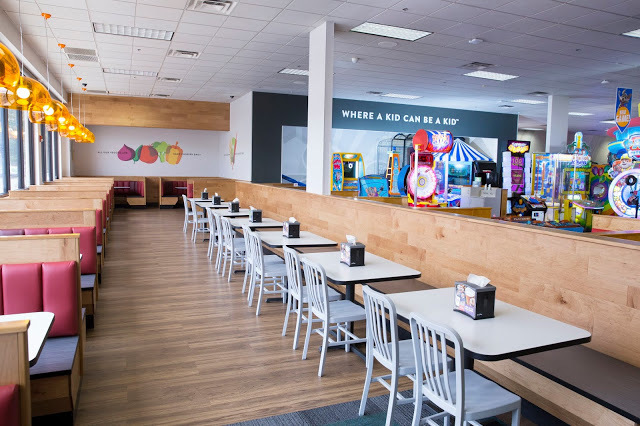 Chuck E. Cheeses' believes that kids only have one job to do- and that is PLAY- that's why the All You Can Play where kids can have unstructured play time to play any game they want as many times as they want, with no restrictions is truly one of a kind. Instead of buying tokens or play points- you can buy time. 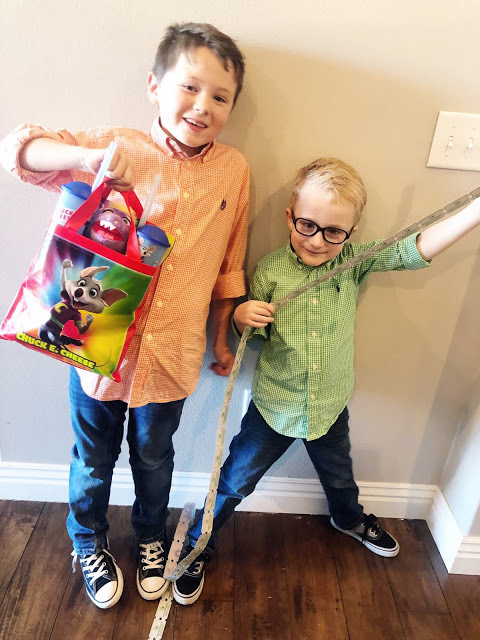 For kiddos that means a whole lot of tickets and prizes and for mom's like me, I can focus on the important stuff and NOT my kids fighting over tokens. Ha! You choose the timeframe and when the time is up, you're done. It really is THAT easy! I like things that make my life easier and THIS is one of those things. So the really awesome thing is that one of the many store that has been updated it local to where I live, in Fort Smith, Arkansas (pictured below)! 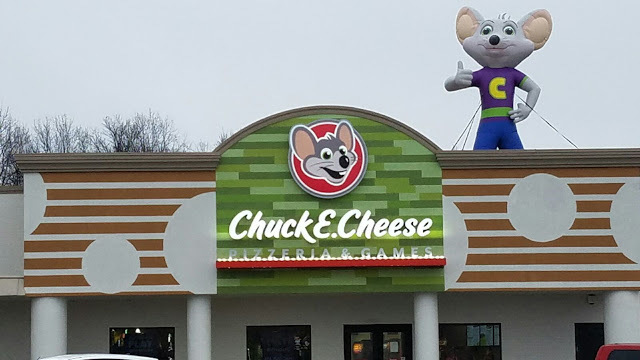 You can find more information about Chuck E. Cheese and the new remodeled locations on the Chuck E. Cheese website, on the Chuck E. Cheese Facebook, on the Chuck E. Cheese Instagram or on the Chuck E. Cheese Twitter pages! VBS led us back to our home church this time last year, so I knew this year I wanted to serve and I couldn't wait for my boys to attend! We spent three weeks decorating and getting ready, and the week of was SO amazing and exhausting but I loved it! My big boys both got to participate and were in groups with their good friends! I helped with preschool kid vid and had THE best time and best group to work with! It took a massive amount of caffiene to get through the week but we did it!! Loved my time leading KidVid with this sweet friend of mine, Nicole! Sawyer went to the baby class and had a great time every day too! It was such a fun week! Close to 1000 kids were in attendance all week! It was AMAZING and the staff at FBC did an incredible job! KidVid Crew! Loved serving with these ladies all week! I wish I could end telling you that it was all roses and daisies with my kids all week-- but it wasn't. Hudson absolutely loved it. Rhett had a very hard time and by the end of the week I decided to let him spend the last day with Pa. I guess VBS isn't everyone's cup of tea. We will try again next year and hope he does better! Shipwrecked 2018 is in the books and it was a great one!